COASTAL WATERS FORECAST: Northeast winds 10 to 15 knots. Seas 2 to 3 feet. Protected waters choppy. Chance of showers. COMMENT: We got to the fishing hole with a nice soft gentle rain and no wind. The temperature was mild so it was nice. 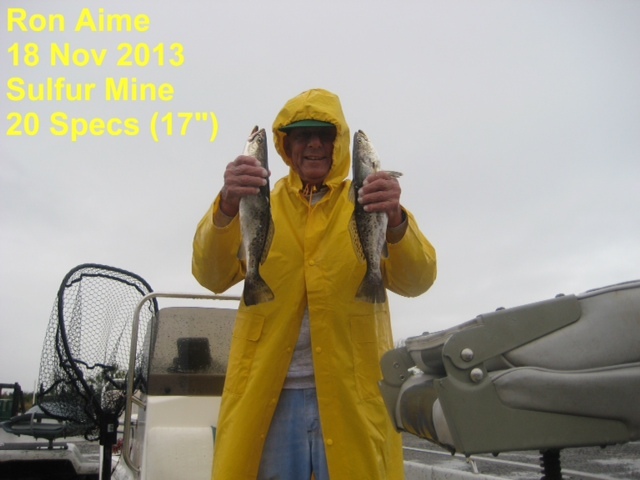 On our second trip to the Mine we got a strong North wind with a driving rain that almost blew us out of the water so we headed for the dock. I guess it will have to get a lot colder for the Sulfur Mine to be more productive.